The Senate passed a bill to save the indebted U.S. Postal Service, including a new idea that would save nearly half of the processing plants slated to be closed next month. WASHINGTON (CNNMoney) -- The Senate on Wednesday passed a plan to save the struggling U.S. Postal Service, an effort that could save thousands of jobs and 100 mail processing plants now slated to be closed or consolidated next month. In an unusual showing of bipartisanship, the Senate voted 62-37 to throw a lifeline to the indebted Postal Service. Without help, the Postal Service would otherwise cut Saturday service, delay mail delivery and close hundreds of postal processing plants and post offices, triggering thousands of job cuts nationwide. "My hope is that our friends over in the U.S. House, given our bipartisan steps we took this week, will feel a sense of urgency," said Sen. Tom Carper, a Delaware Democrat, one of the Senate bill's co-sponsors. "The situation is not hopeless, the situation is dire." The House has yet to take up a different bill to reform the Postal Service. However, Rep. Darrell Issa, a key Republican on postal service legislation, called the Senate bill "wholly unacceptable," in a statement released Wednesday. Congress faces a deadline of May 15, when a moratorium on postal closures expires. The recession, declining mail volume and a congressional mandate to prefund retirement health care benefits have put the service in a bind. It reported a $5.1 billion loss for the year ended Sept. 30. The Senate bill, offered by members in both parties, forces the Postal Service to ease off part of its plan to slow down the delivery of first-class mail, the kind of mail that most consumers use. The bill makes controversial changes, including cuts to workers' compensation benefits, as well as a transition from door-to-door delivery to curbside delivery in some areas, such as suburban neighborhoods. The Senate bill also prevents the Postal Service from cutting Saturday delivery for two years, until the agency can prove such a cut is needed as a "last resort." During debate on the postal bill the past two days, the Senate agreed to order the Postal Service to postpone the May 15 expiration of a moratorium on closures until the House passes a postal service bill. The cost of the Senate bill could prove a major sticking point with the House. The Congressional Budget Office says the bill would cost $33.6 billion over 10 years. The tab comes from increased borrowing authority for the Postal Service, allowing it to borrow $11 billion more from Treasury. 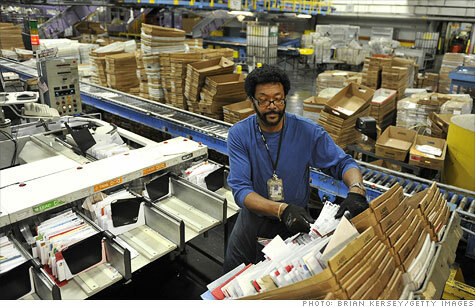 The Postal Service can currently borrow up to $15 billion, and has tapped $12 billion of that loan. The other cost comes from elimination of regular billion-dollar payments, now required by law, to Treasury to pre-fund health care benefits for retirees. That $23 billion would ease financial pain for the Postal Service, but it also means less revenue to ease federal deficits. Several Senate Republicans, including Sen. Bob Corker of Tennessee, said they voted against the bill, because it wasn't paid for in an appropriate way. Earlier this year, the Postal Service said it was doing away with overnight delivery of many kinds of first-class mail, opening the door for closing 223 mail processing plants at a cost of 35,000 jobs. The Senate bill would force the Postal Service to maintain some one-day delivery of first-class mail, mostly for items mailed within the same processing area -- saving 100 mail processing plants. The Senate bill would also tap most of an estimated $10.9 billion overpayment in the Federal Employees Retirement System to pay down postal service debt and use up to $2 billion on buyout packages to entice long-time employees to retire. Unions oppose the Senate bill, saying it doesn't provide a good long-term business model. "We are very disappointed that the Senate approved such a flawed bill, but we are determined to continue the fight for legislation that will provide a path to long-term viability for the Postal Service," said Fredric V. Rolando, president of the National Association of Letter Carriers. The U.S. Postal Service is, by law, an "independent establishment" of the executive branch. The agency doesn't normally use tax dollars for operations, except for its $12 billion loan from Treasury.